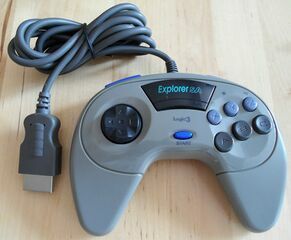 The Explorer SA by Logic 3 is a third-party control pad for the Sega Saturn. It is identical to a normal pad aside from added turbo features and programmable functions. Explorers were made for other consoles too - the Explorer SG for example is designed for the Sega Mega Drive.